Grand Rapids’ Black Hills is a quiet neighborhood at the foot of a steep hill. While scenic pictures and intense bike workouts pair nicely with the hill, stormwater does not. Rain creates water runoff. Runoff traverses down slopes and along paved streets. Put hills and streets together and runoff becomes heavy and swift. Currents travel far and cause flooding that is — at best — annoying, and — at worst — damaging. Litter, chemicals and other pollutants can be picked up in the process, and carried and absorbed into the watershed, jeopardizing water quality and wildlife. So, in 2017, Black Hills’ Dorchester Avenue underwent a $1 million reconstruction, funded by the City of Grand Rapids’ Vital Streets Fund. Nearly $175,000 of the reconstruction went towards green infrastructure that absorbs or diverts runoff flow and its contaminants. Drive down Dorchester now and, aside from a smoother drive, little seems to have changed. Yet, the area is rife with subtle improvements that minimize pollution and flooding from runoff. In 2013, research on Grand Rapids streetscapes determined that nearly 90 percent of city roadways were in danger of receiving a “poor” rating based on Pavement Surface Elevation and Rating (PASER) standards, a street pavement condition system developed by the University of Wisconsin-Madison. The minimum improvement needed for “poor” streets is full structural renewal. So, Grand Rapids voters approved the Vital Streets Fund in 2015 to fix their roads. Residents declined a 13.3 percent income tax cut until 2030 to provide upwards of $10 million each year to transportation infrastructure improvement. Reconstruction of Dorchester Avenue in 2017 through the Vital Streets Fund. The gravel marks the outline of an infiltration basin. The Vital Streets Fund program reconstructs and renovates streets, trails, sidewalks and road crossings to make them safe, functional, attractive, protective and restorative to water systems. Vital Streets is meant to benefit not just drivers, but cyclists, pedestrians, transit-users and ride-sharers. Vital Streets has set numerous goals to reach before its 2030 expiration, including cutting drive-alone commutes in half, eliminating serious traffic accidents, promoting non-vehicular transportation, cutting carbon dioxide emissions from vehicles, accommodating age-friendly commuting and having 70 percent of streets obtain a “fair” or “good” PASER rating. The Stormwater Oversight Commission makes sure stormwater improvements are effectively completed. The nine-member coalition of Grand Rapids citizens reviews Grand Rapids’ stormwater management and policy and makes recommendations to the city. The commission recommended the adoption of Americans Rivers’ Green Infrastructure Portfolio Standard and the City’s Green Guidance Manual, which helps site owners understand green infrastructure. The City Commission adopted both. The portfolio is the only infrastructure standard adopted by a U.S. community. Over $500,000 of stormwater updates were installed by the city during their 2016-2017 fiscal year. Over 400 trees were planted and 62 infiltration basins, 44 porous tree grates and 1,400 square feet of porous pavement were installed. 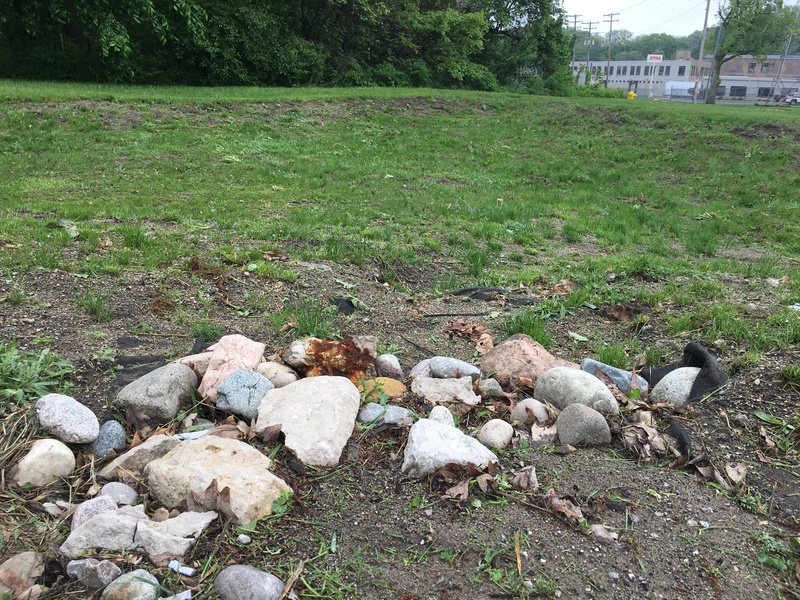 The City also used a $2 million Stormwater, Asset Management, and Wastewater grant from the State of Michigan to create a computer model of the stormwater and watershed system and to update the City’s stormwater public education program. The application of this grant is as difficult to visualize to many Grand Rapids residents as the infiltration basin and porous pavement along Dorchester Avenue. Even the words “infiltration basin” and “porous pavement” come with the baggage of being environmental jargon. The results of Vital Streets are often tangible when driving, walking or biking — smoother roads, safer crossings, easier navigability — but Vital Streets’ green infrastructure improvements are often not. Three major reconstruction projects of the past and present have been highlighted to bring the intangibility of a stormwater system update to a tangible state. Not only is the Black Hills neighborhood situated near the foot of one of Grand Rapids’ steepest hills, Black Hills itself is on top of a slope. Dorchester Avenue, Black Hills’ thoroughfare, starts at the neighborhood’s highest point and spills out onto Hall Street, right next to Kensington Park. Black Hills’ placement relative to the steep hill makes it a flood and pollutant-gathering hotspot when stormwater runoff occurs. Many properties are sloped towards streets. The streets are sloped toward Dorchester and, in turn, to Kensington Park, making the green space especially vulnerable. Black Hills has strong tree coverage, which can absorb runoff, but stormwater still posed a threat. So, the City of Grand Rapids installed stormwater management infrastructure. When turning off of Hall Street onto Dorchester, one will see Kensington Park to the right and what looks to be a ditch to the left. That ditch is actually an infiltration basin. Like a ditch, an infiltration basin is a vegetated depression meant to absorb water gradually into an aquifer, a body of rock that contains or transfers groundwater. Unlike a ditch, the only time water stands in the basin is during heavy rain. Infiltration basins are usually wide and semi-circular. The vegetation in them both diverts and absorbs some of the excess runoff and any nutrients that could contaminate groundwater. Part of the infiltration basin is lined with gravel for extra absorbance. Dorchester Avenue’s infiltration basin flows into a long bioretention basin, another ditch doppelganger. This landscaped bioretention basin makes an infiltration basin seem crude. Before runoff hits the bioretention basin itself, a grass barrier meets it first. The slowed and partially absorbed runoff must then work through more vegetation before falling through soil, mulch and sand for pollution treatment. Excess runoff is stored in a shallow pond that’s a bit like an infiltration basin. After falling through the layer of sand, some of the water will be absorbed into the aquifer. Other water is diverted to an underdrain system, which transports the water to a storm drain or a nearby body of water. Water that manages to stay on Dorchester Avenue will have to make it across the street’s porous pavement. Rainwater easily passes through the holey surface rather than traveling along the road. Pollutants are picked off and drains are kept from overflowing. 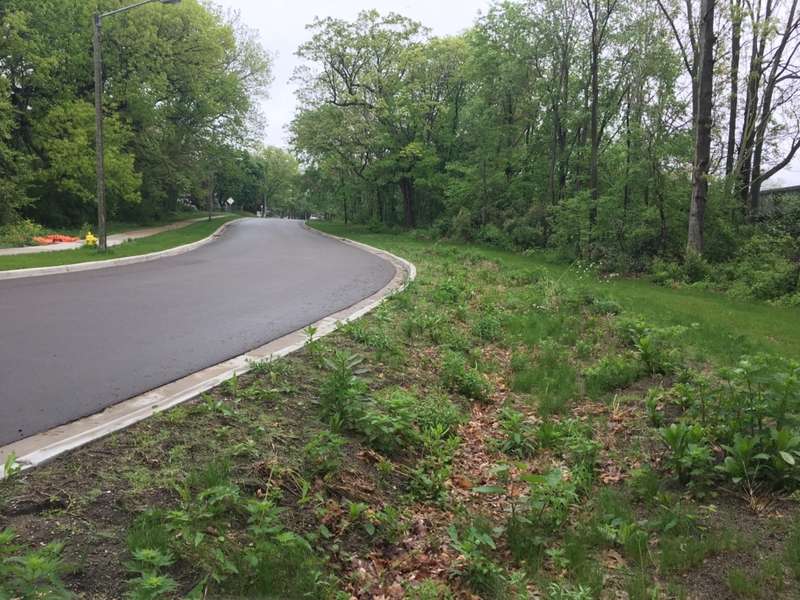 This tiny 250-foot pedestrian strip in front of the Van Andel Institute and Immanuel Baptist Church is packed with natural stormwater management systems that are both effective and aesthetic. Like Dorchester, this section of Michigan Street is steep. To minimize runoff problems, its sidewalk was lined with bioswales. Bioswales act as stormwater slides, meant to maximize the time that the water stays in its low tract of moist land, maximizing absorbance. The bioswale is lined with vegetation and rocks, together called riprap, to guide the water that is not absorbed by the mulchy earth into storm drains. Along Michigan Street, bioswales are repeated every few yards. Just past Immanuel Church is a row of stormwater systems called rain gardens. Here, blocked-off patches of shrubs, perennials, grasses and trees temporarily hold stormwater runoff, cleansing it in the process. Runoff then falls through mulch and stones for further pollution treatment. About a half-mile west of the Grand River, between the Alpine Center and West Grand neighborhoods, lies Richmond Park, infamous among high school cross country teams for its daunting hill and cumbersome concrete. A large pond sits at the foot of the hill. Richmond Park can be a waterlogged place. 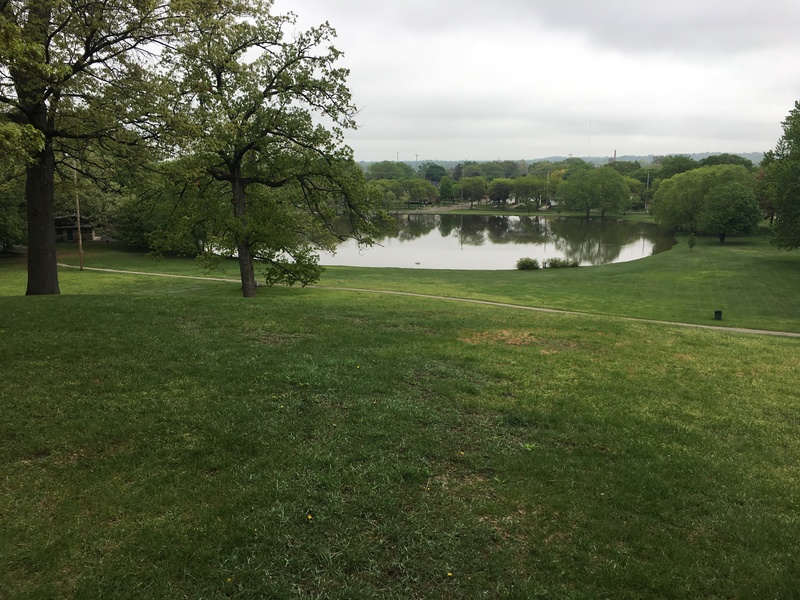 While Richmond Park, of course, is not a street, its hill sends contaminated, fast-flowing water into its pond, which can in turn flood and then impact the surrounding neighborhood. The concrete path that partially lines it only worsens a flooding situation. Richmond Park’s water system will soon be daylighted, meaning that a pipe that brings the Indian Mill Creek to the park’s pond will be removed. A small, open waterway will be put in its place. An inlet, a small arm of a body of water, from the Indian Mill Creek will be redone to allow water to pass easily. Its small dam will be removed and replaced by a more natural structure with a passage for fish. Richmond Park’s pond is surrounded by a hill, a street, a parking lot and a pool. On adjacent Richmond Street, 875 feet of a sewer main was lined with cured-in-place pipe lining, a jointless, seamless lining meant to keep pipes from breaking down, whether by a storm or by gradual wear-and-tear. Each adjustment to the park is meant to create more open water space and flow, reducing the amount of standing water on the ground from storms. Grand Rapids will continue to make improvements on the inlet of Richmond to prevent sewer overflows in 2018. 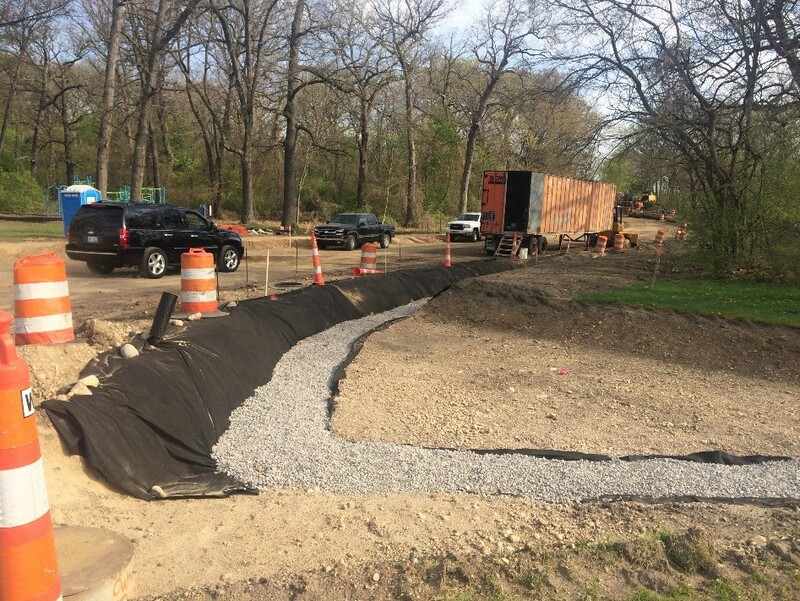 Other 2018 projects by the city in stormwater management include pipe repairs and slope restoration on Oakleigh Avenue and inlet repair on Glen Echo Drive. Construction photo courtesy of the Stormwater Oversight Commission. Other photos by Beau Brockett Jr.